A character's physical, mental, spiritual, and other characteristics are represented by a statistic, usually a number, as a way of quantifying those attributes in game mechanics. The number and type of attributes used varies from game to game. 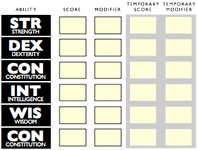 Typically, Attributes' values do not vary often (or at all) during play. Typically, Attributes are considered to be innate or inherent components of a character (e.g., not learned or taught).